Schools around the country celebrated Dr. Seuss's birthday today. We had great fun in the library, looking at so many Dr. Seuss books - old favorites, and others that kids don't know as well. My 1st grader was gushing about fun she had in her classroom, doing Dr. Seuss puzzles and having a pajama party to celebrate! We celebrated at home by trying some Dr. Seuss iPad / iPhone apps. They are best-selling apps for both the iPad and iPhone, and they are great examples of eBooks for young children. "Would you eat them in a box? Would you eat them with a fox?" 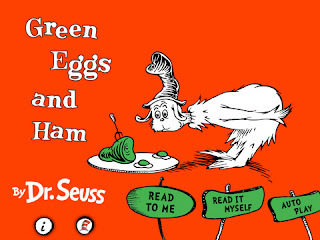 Sam-I-am is sure that his friend will love green eggs and ham, and he'll follow him anywhere to ask him. He tries everything - in a house, with a mouse, in a box, with a fox, with a goat, on a boat - but without any luck. Until finally, his friend does try them! Oh, joy - "they are so good, so good you see!" This eBook will appeal to toddlers and preschoolers, as well as 1st and 2nd graders learning to read. The narrators' voices match the tone of the story perfectly, helping the readers feel the characters' emotions. You can hear the pleading and insistence in Sam's voice, and the stubborn denial and exasperation in his friends' voice. Kids will giggle as they hear the character's voices echo in the tunnel, or burble under water. The eBook also uses the touch technology perfectly. Readers can tap on any part of the picture, and the word for that picture floats up on the screen and the narrator speaks the name for that item. This is just how parents read with their toddlers, and how teachers label classrooms for emergent readers. I especially liked how this eBook was quite simple and straight-forward. It did not have too many distracting features, but rather focused on telling the story well and engaging children with the story and the text. It is beautiful on the large size of the iPad, but will also fit the iPhone very well - and may be the perfect thing to entertain your child the next time you're stuck in traffic or waiting for an appointment. This video of The Cat and the Hat eBook gives you a good sense of how the Oceanhouse Media eBooks works. The review copy came from our home collection. Enjoy! I love this little article! 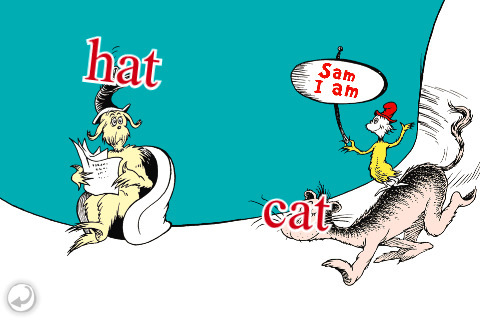 Its great to see people celebrating Dr Seuss birthday, I myself have the Cat in the Hat ebook app, i show it off to my nephews all the time, they love it!